Tea transport PAX East 2018 exclusive cosmetic ship skin. Small ships for solo content. Medium ships for group content. Large ships for raid content. The prevailing thought among the developers is that ship navigation may be through the use of a spyglass that gives direction and skims the horizon, as opposed to "radar" navigation. 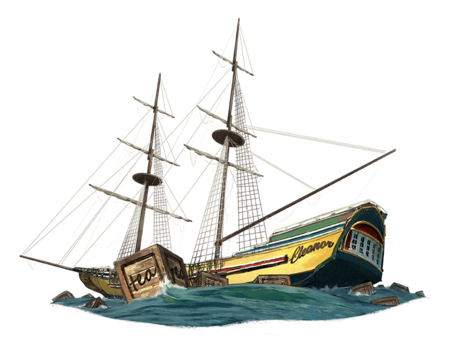 Ship physics may be simulated to avoid performance issues. Ship assets will likely be released leading in to Alpha-2. Ships are divided into classes of vessel, which relate to their capabilities in battle and in transportation. Certain ship classes will have the ability to render Crowd control (CC) effects on other ships, such as a harpoon effects. There may be fishing boats in Ashes of Creation. Ships can only be summoned from a port or harbor. Ships may be able to be summoned in rivers (or other bodies of water) depending on the depth of the water. Ship building will enable players to customize ships. Speed, Hit points, and Damage abilities. Players can choose which "joints" get populated with either utility or weaponry spots on a ship. Ships and Buildings will be able to be named. The custom name will appear as floating text when it is targeted. Naval combat involves different types of Ships with varying capabilities, armaments and roles to play out on the high seas. There will be a balance and counterbalance between ships from PvP and PvE perspectives. Naval PvP is between ships. Naval PvE includes open sea raids and sea-based bosses. Gunpowder (black powder) weapons will not be present in Ashes of Creation. Weaponry such as Potion launchers, Siege weapons and weapons used in Naval combat are based on the arcane arts. The use of radiance and darkness. 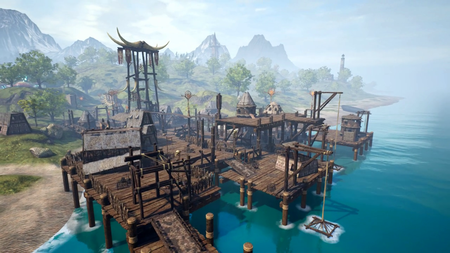 Harbors can appear along the coast as a result of a node being developed on or near to the coast. Harbors will likely grant quests that are related to naval content. Harbors will provide a number of services including upgrades to boats. Snapchat Sneakpeak, 9 November 2017. Naval content refers to content above and below the sea. Naval content was unlocked as part of the $1,500,000 Kickstarter stretch goal. Ship skins apply to certain ship types. ↑ Ashes of Creation Store: Tea transport. ↑ 2.0 2.1 2.2 2.3 2.4 Livestream, 28 July 2017 (47:53). ↑ Livestream, 31 October 2018 (54:21). ↑ 5.0 5.1 5.2 5.3 5.4 5.5 5.6 Livestream, 17 May 2017 (30:53). ↑ Livestream, 27 September 2018 (54:02). ↑ 7.0 7.1 Interview, 11 May 2018 (11:51). ↑ 9.0 9.1 9.2 9.3 9.4 Livestream, 23 August 2017 (28:22). ↑ 10.0 10.1 Livestream, 8 April 2018 (AM) (15:46). ↑ Livestream, 24 May 2017 (30:09). ↑ 12.0 12.1 Podcast, 11 May 2018 (11:51). ↑ Livestream, 19 May 2017 (50:45). ↑ Interview, 17 August 2018 (36:29). ↑ 16.00 16.01 16.02 16.03 16.04 16.05 16.06 16.07 16.08 16.09 16.10 16.11 Livestream, 17 May 2017 (55:40). ↑ 18.0 18.1 18.2 18.3 Livestream, 31 October 2018 (47:44). ↑ 19.0 19.1 19.2 19.3 19.4 19.5 Interview, 20 October 2018 (3:35:54). ↑ Livestream, 31 October 2018 (46:18). ↑ 21.0 21.1 Livestream, 9 July 2018 (36:05). ↑ Livestream, 16 June 2017 (43:01). ↑ 23.0 23.1 23.2 23.3 Interview, 17 August 2018 (17:57). ↑ 26.0 26.1 Livestream, 9 July 2018 (30:35). ↑ Video, 9 November 2017 (0:01). ↑ Kickstarter - We Just Broke $1,500,000!